I was blown away to look at the follower counter on my blog this afternoon and see the number "100." I only started blogging at the end of last December with this entry and the quilt that you see above you. At the time I could never have imagined what a blessing it would all turn out to be. There are so many wonderful things I've been able to do and learn through the online sewing community, and I'm so grateful to those of you who have come along on the journey with me. Thank you from the bottom of my heart. But to say thank you in a more tangible, concrete, how-about-some-free-stuff sort of way...let's have a giveaway! I've pulled some goodies from my stash to send off to one lucky winner. Worldwide entries are welcome -- I haven't forgotten my promise to hold a giveaway that includes my international friends! Up for grabs are a dozen charm squares including prints from Half Moon Modern, Salt Air, Circa 1934, and Good Fortune. I also tucked in some Kona solid strips and a fat quarter from the Flora collection. I have no doubt that a few more treats will be added to the pile before this gets mailed away. To enter, just leave a comment on this post. I'll choose a winner on Friday morning. Please do make sure that you're not a no-reply blogger when you leave your comment; I hate having to disqualify someone because I can't get in touch with them! Thanks again to all of you who have given me so much encouragement over the past few months. You guys are the best. 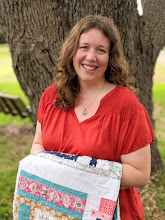 Michelle Brummer Everett's new Monsterz collection for Cloud 9 Organic Fabrics brings new meaning to the word "cute." While my girls are normally a little fearful of monster prints, this one was met with squeals of glee. The scary factor is toned down quite a bit due to the fact that the critters look more like happy guinea pigs -- at least, that was my husband's first take on them. It was the perfect fabric for a little project I've been meaning to make: a pouch for my oldest daughter's math flash cards. The outside of the pouch is Monsterz Mash in Pink, and I lined it in Spotlight in Pink -- using an extra strip for the wrist strap. I topped it with a bright green zipper which gives a great pop of color. I've only used white zippers before on my pouches, but seeing the effect of this one makes me want to go out a buy a whole rainbow's worth for future projects. In our house, flash cards disappear down a black hole as soon as they leave the box; I honestly don't know how it happens so fast. I figured that if I could make a nice little pouch to keep them in, they might be spared a little longer than five minutes. So far, that theory seems to be working. Bunny is so excited to carry the pouch around with her, that she's keeping the flash cards safely inside or even -- shock of all shocks -- taking them out to practice with them from time to time. Hallelujah. Linking up to Sew Modern Monday & Manic Monday. Since I first bought my copy of Zakka Style, I've been looking forward to making the sewing kit on the cover, and I wasn't disappointed. What a great little project this was, fun to design and easy to put together. For my version, I used Elements in Cream from Circa 1934 by Cosmo Cricket. There are some wonderful accent pieces in this print which I've been saving for something like this. I had originally intended to use natural colored linen, but the overall effect was a little too beige for my taste. Grey works as a better contrast. I didn't have any leather thongs for the ties, so I followed Katy's tutorial and made my own out of fabric. I like the effect very much. I appliqued another little piece of fabric on the back of the ends which you can see when it's halfway open, and embroidered my sister's initials on the outside of the kit since this is a gift for her. My kit will be off to its new home at my sister's house this weekend, as she is celebrating her birthday on Monday -- there are a ton of birthdays in our family this week. She's quite a creative seamstress herself, so I know it will get lots of good use. Happy Birthday, Sis! 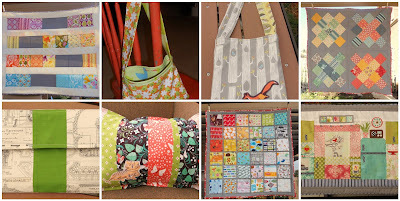 Linking up to Finish It Up Friday, Sew & Tell Friday, Confessions of a Fabric Addict, and Zakka Along. I had a birthday present to make for my sister-in-law this week, and knowing how much she loves bags, I reached for my copy of Bags: the Modern Classics by Sue Kim. 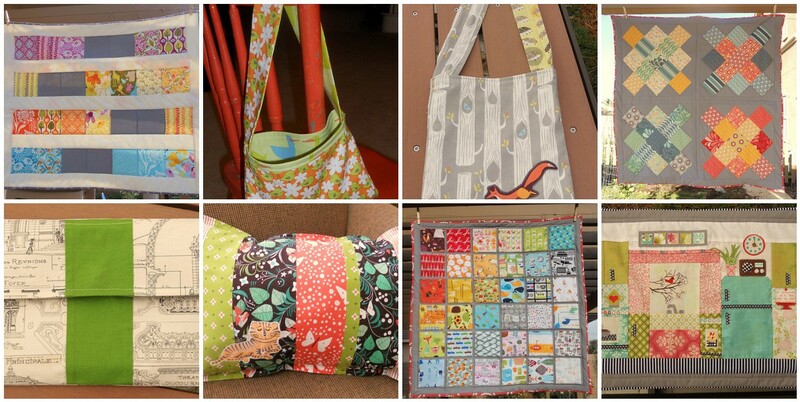 When I saw the pattern for the Sweet Annemarie Bag, I knew I had found it. It's a small crossbody purse, perfect for a person on the go like my sister-in-law. I used a few Denyse Scmidt prints for the purse and lining, adding a applique flower to the front of the purse from a print by Liz Scott for her Power Pop collection. To go inside the purse, I made a small zipper pouch with a little of my treasured Melody Miller stash, lining it with a bit more coordinating Denyse Scmidt. I love those transistor radios! This was such a fun set to make. It feels great to know that I can do things like this now -- bags, zippers, magnetic snaps. There are so many projects that I skipped in the past because I was afraid of dealing with the hardware issues. I've learned that it's far better to take a deep breath and give it a shot. Nine times out of ten, it's nowhere near as bad as I thought it would be. I've got a list of other projects for the week that seems to be getting longer by the minute. Hopefully I can make some progress on it tomorrow. Linking up to Fabric Tuesday & Work In Progress Wednesday. When the amazingly talented Joanna of Shape Moth said that she was looking for people to test a few of her new paper piecing patterns, I was more than happy to throw my name into the ring. The pattern she ended up sending me was her adorable Retro Phone -- could there be a more perfect fit for me? This was my first attempt at paper piecing, and I have to say that I enjoyed it. It takes a little time to wrap your brain around the process, and my seam ripper has never gotten so much mileage in one day, but it's a fun challenge...sort of like putting together a fabric puzzle. I highly recommend that if you're trying it for the first time, that you watch a video demonstration. I found this one to be helpful, but I know there are more out there, so look around. There are a mix of fabrics from different lines here including Aunt Edna by Denyse Schmidt, Reunion by Sweetwater, Hometown by Sweetwater, and Flora by Lauren and Jessi Jung. After some deliberation, I densely quilted the background so that the phone would stand out. As a last touch suggested by my mother, I added the number dial in the middle of the phone. This was a great weekend project which will now make a nice little wall hanging. Thanks so much, Joanna, for giving me the chance to learn something new! I was excited to see my Zakka pincushion on the weekly picks again on LR:Stitched. This week we get to tackle the sewing kit, demonstrated by Katy of Monkey Do. I've been looking forward to this project -- definitely an item that will get some use around here! Hoping you're all having a great start to your week today. Linking up to Manic Monday. All in all, it's been a rather difficult week around here. Last night I was exhausted and drained, but I wanted to finish my Zakka project before the weekend. What a sweet, simple little pincushion this was to make. It was almost therapeutic to sit down and put the pieces together. I used one of Melody Miller's darling retro clocks from Ruby Star Shining, twill measuring tape, grey linen, Hometown Town News from Sweetwater, and a few buttons from my mother's stash. I would have added a stamped element, but I haven't yet bought any fabric stamping materials. Still, it's full of things that I love -- retro goodness, newsprint fabric, and favorite colors. All in all, a welcome bit of happiness in what had otherwise been a pretty bleak day. When I sat down to draw a logo for my blog, I knew exactly who would be the muse for Fabric Mutt: my sister's beloved toy miniature dachshund, Naomi. This afternoon, my sister and I had to take Naomi to the vet to be put to sleep. She was almost fifteen years old and in very bad health, yet I can still see her as a tiny puppy being rocked to sleep in my sister's arms. Good-bye, little one. You will be so dearly missed. Mixed Signals is done, and I have to say that I'm absolutely loving this quilt. It's backed in one of the bunting prints from the Reunion line, and I bound it in Hometown Town News, also by Sweetwater for Moda -- one of my very favorite prints. When I first saw Reunion by Sweetwater for Moda, I immediately saw piers, boardwalks, and boats. I've been holding on to two charm packs for weeks now, trying to decide how I could put together a mini quilt with a nautical theme that would suit this fabric. Over the weekend it finally came to me: signal flags. Each three inch block in this quilt is one of the international code flags used to represent certain messages as well as letters of the alphabet -- you can follow the letters from A to Z as you go from left to right, top to bottom. I had originally planned to sash the quilt in white to make it a little brighter, but since white is one of the main colors for the flags, I thought that grey would make it stand out a little better. I can't tell you how much fun I had making the blocks for this quilt. Sometimes piecing can be a bit tedious, doing the same block over and over for a project. Every block was a new challenge with this one, and I enjoyed figuring out how to put each one together while staying inside the size requirement. I have to fix a few puckers in the fabric this morning before attaching the binding, but I'm really loving the way this has turned out. I seem to have a boatload (no pun intended) of projects going this week, including this week's Zakka pincushion and a paper piecing pattern to test. It's all good stuff, though, so I'm happy. Linking up to Work In Progress Wednesday. 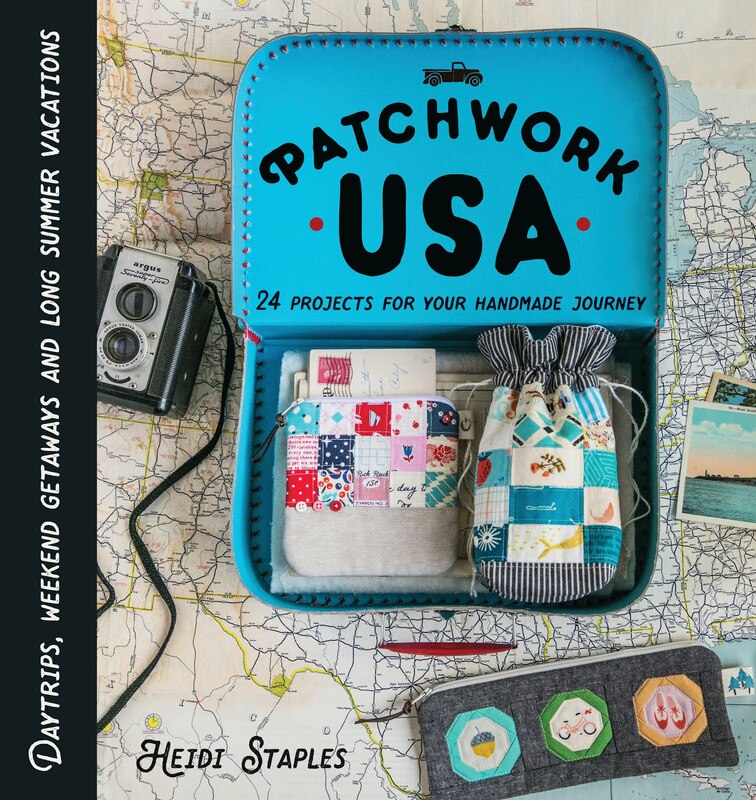 I was enjoying my morning blog time today when, lo and behold, I saw my own little house pouch among the weekly picks at LRstitched, one of our hostesses for the Zakka Style Sew Along. How exciting is that! Drop by if you get the chance -- there are some amazingly creative pouches on there. This week we get to make a darling little pincushion, guest blogged by the incredibly talented Ayumi of Pink Penguin. You'll want to stop by her blog, too, believe me! A fun project popped up over the weekend which I hope to have ready to share in a day or two. Hope your week is off to a great start. Have a fantastic Monday! Linking up to Manic Monday. After an emergency trip to urgent care last night and two doctor appointments this morning, we've discovered that we now have three bad cases of ear infection on hand. Thankfully my Bunny, Bear, and Mouse are all on medication now, and as I type, they are snuggled up under quilts and happily watching Tangled for the 300th time. In the midst of caring for my sick little kiddos, I've been able to fit in snatches of sewing time here and there, so I finally finished my Zakka house pouch as well as the last Castle Peeps quilt top for Miss Bear which you can see above. She's very happy with it, and so am I. After checking each of the three quilt tops for size, I realized that I need to make Bunny's quilt a tad longer (she's definitely been going through a growth spurt lately). Once I add the extra fabric to the top and bottom, I'll start the quilting process. I can't wait! Hope you all have a wonderful -- and healthy! --weekend. Linking up to Finish It Up Friday, Sew & Tell Friday, and Confessions of a Fabric Addict. I think what I love most about the Zakka Style Sew Along is that I'm not only making at least one cute project a week, I'm also tucking away so many great lessons along the way. This was my first zipper installation, and I've been dreading it so much that it wasn't nearly as bad as I thought it would be. The house pouch is an adorable little piece with so much room for creativity. I used a natural linen blend for the house body and one of my favorite Joel Dewberry herringbone prints for the roof. The girl in the window is a leftover scrap from my Yuwa calendar girl print; I wanted my house to have someone at home. The door was a random brown and white polk-a-dot scrap from JoAnn's, and the lace and buttons were from my mom's stash. I put a teal dot print from Half Moon Modern inside for the lining. My daughters were all scrambling to be the lucky winners of this pouch, but this one went to my amazing mom. I hope she enjoys using it as much as I enjoyed making it for her. Linking up with TNT Thursdays. Hope you all had a happy Easter weekend! Linking up with Manic Monday. Rule number one in following any sewing pattern: read the directions thoroughly before you start. Guess who didn't follow rule number one this week? Despite a near catastrophe due to my failure to pay attention to the directions for the Zakka Style Sew-a-Long's Zig Zag Bag, I was able to turn out a fairly respectable product yesterday afternoon. Those of you who are familiar with the original will notice that the zig zags are actually bigger than they're supposed to be, but we won't talk about that... The bag looks deceptively simple, but there was a lot more work to it than I was expecting. This was my first time working with both linen and fusible batting...an interesting experience. My sewing machine wasn't crazy about either of them at first, but I learned how to make it work. All of the fabric is from JoAnn's this time -- Denyse Schmidt prints and grey linen for the outside, and an unknown grey and white houndstooth that I found in the remnant bin for the inside. I already took the bag for a test drive last evening, and I'm a fan. It makes a great little book bag, which will definitely come in handy around here. Linking up to Finish It Up Friday, Sew & Tell Friday, and Confessions of a Fabric Addict. I'm continuing to work on the new Castle Peeps quilts for my three daughters' beds. So far I've finished two out of three...quilt tops, that is. We have a ways to go before they're bound and in use. The girls keep changing their minds as far as which one they want. I think we'll hold off on staking any claims until they're ready to go on the beds. Quilt number one will probably be the simplest version...just stripes of color down one side. I'm still trying to decide how I want to quilt this one. Any suggestions? Quilt number two was a lot of fun to put together. I've been wanting to try wonky stars for a while now, and I'm so glad that I did. I love the way they look: bright, cheerful, and perfect for a child's quilt. I'm going to add a border around this to increase the size before quilting it. I also started work on my zig zag tote for the Zakka Sew Along. I decided to use a few Denyse Schmidt prints from her JoAnn's collections. The orange one is from Aunt Edna, and the turquoise one is from Sugar Creek and Winding Road. I found some grey linen for the outside fabric, but I haven't completely made up my mind yet about the lining. I have to confess that I stayed in my comfort zone and pieced the zig zags using half square triangles rather than following the exact process in the book. There are definite imperfections going on here, but I'm always learning new things about this craft and that feels good. And speaking of happy news, have you heard about the Modern She Made Swap? I've been trying to get into a project swap for a few months now, but they always seem to be full or exclusive. When I heard that sign-ups for this one started April 1st, I was so glad to know that there was hope at last. Sign-ups are continuing through April 6th or until they hit 100 members, so get your name in now! When I first saw Retro Girl Calendar Stripe from Yuwa of Japan, I was in love. The fabric sat waiting patiently in my closet for weeks while I tried to come up with a project worthy of it. I wanted something that I could see every day, but that would also be practical. The answer was this little calendar. I fussy cut all of the sweet calendar girls, alternating them with one of Heather Bailey's Skip Dot prints from her Nicey Jane collection. The two long flaps are Check from Bliss by Bonnie & Camille for Moda, and the back is a Flowers print from Momo's Just Wing It. I bound the little quilt in my favorite black and white check print from the local Hobby Lobby, where I also picked up the miniature clothespins and numbered game pieces which I glued together for the date markers. I love that this calendar does not involve a million tiny pieces that have to be kept in a separate container and then fished out one at a time (a problem I've had with past versions). Having all the markers clipped onto the bottom makes the daily changing-of-the-date ceremony quick and easy...two words I find hard to resist when it comes to a new project. Linking up to Sew Modern Monday and Manic Monday. How is it possible that another month has gone by? March has been full of opportunities to try new things. I'm amazed at what a chicken I can be about attempting a new project or quilt block, yet when I finally take the plunge, I'm so glad that I did.